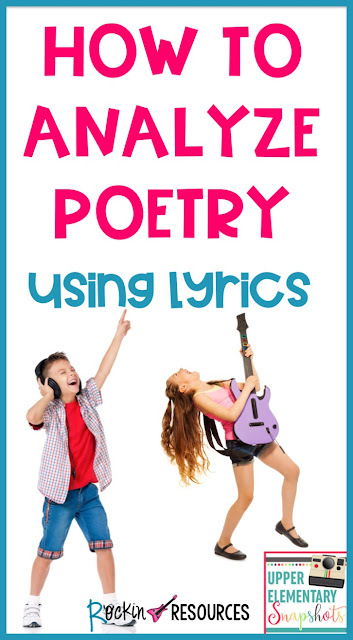 HOW TO ANALYZE POETRY and MAKE IT FUN! How can you make poetry analysis REALLY fun? Use lyrics! Yes, songs and raps are forms of poetry! Students love to listen to the songs and analyze them. They will beg you for more! Keep in mind that all words in a poem have some kind of meaning to poets. They choose words very strategically to not only include evident meaning, but also implied meaning. This is the same with song lyrics. Make your lyrics analysis fun by turning it into a detective game! 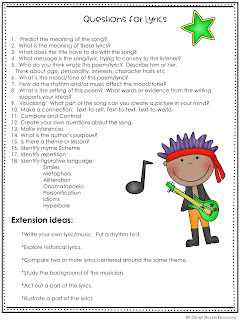 Give your students magnifying glasses while they examine lyrics! 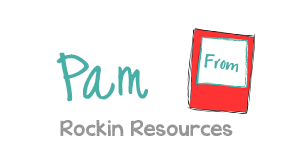 Give them a copy of lyrics to a favorite song and supply highlighters and colored pens! 1. Predict the meaning of the song. 2. What is the meaning of the lyrics? 3. What does the title have to do with the song? 4. What message is the song/lyric trying to convey to the listener? 5. Who do you think wrote this poem/lyric? Describe him or her. 6. What is the mood/tone of this poem/lyric? 7. How do the rhythm and/or music affect the mood/tone? 8. What is the setting of this poem? What words or evidence from the writing supports your ideas? 9. Visualizing: What part of the song can you create a picture in your mind? 13. What is the author's purpose? 14. Is there a theme or lesson? 15. Create your own questions about the song. 16. Identify the rhyme scheme. Write your own lyric/music. Put a rhythm to it. Compare two or more lyrics centered around the same theme. Study the background of the musician. Act out a part of the lyrics. Illustrate a part of the lyrics. Grab this free lyrical analysis PAGE! DO YOU WANT 10 SONGS ALREADY WRITTEN OUT WITH QUESTIONS? THERE IS A VARIETY OF GENRES AND ERAS! 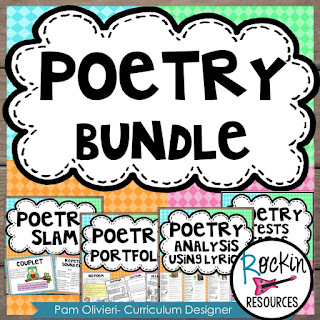 Poetry Slam- Loaded with Anchor Charts for Poetry Types, Elements, and Analyzing! 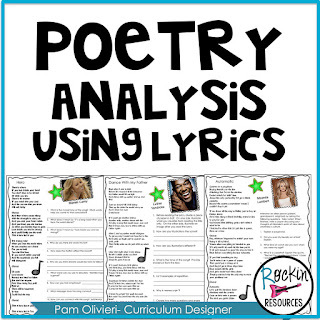 Poetry Lyrics- Includes lyrics for a variety of genres with questions for analyzing! Poetry Portfolio- A student booklet with poetry types- including directions! Poetry Elements Cards- Great for studying!